Evidence is limited regarding the comorbidity burden of patients with cluster headache (CH). We aimed to characterize comorbid conditions in a cohort of CH patients diagnosed by headache experts, using electronic health record information from the Partners Research Patient Data Registry (RPDR). 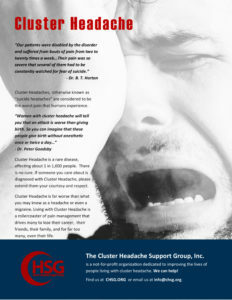 Cluster headache (CH) is characterized by attacks of severe periorbital pain associated with autonomic symptoms. As with other forms of primary headache, structural lesions should be excluded, particularly if the headache presents with an atypical pattern.